So just after the tons of rumors about an even higher end “consumer” platform from AMD were going around, AMD actually went ahead and announced it. AMD’s Ryzen 7 CPUs already offer eight cores and 16 threads for those who can take advantage of as much multithreaded compute power as possible, but some folks need even more. For those power users, AMD will be introducing CPUs with up to 16 cores and 32 threads this summer, and they’ll be called Ryzen Threadrippers. AMD says it’ll have more details for us at Computex in a couple weeks. 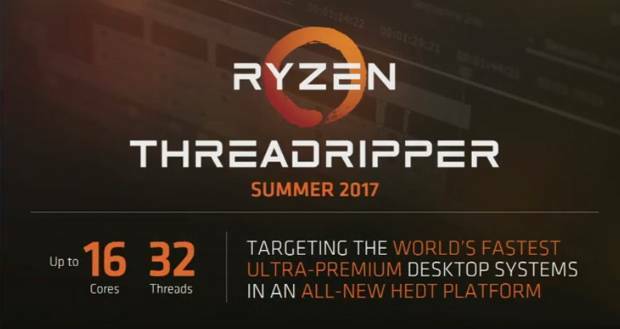 It looks like Threadripper will go straight against the higher end Skylake-X CPUs. It’s interesting that AMD has, just like Intel, decided to split the platforms, except that AMD has decided to make their higher end platform only make sense to consumers that need a lot of cores. It’ll be interesting to see the prices of these CPUs, and to see how Skylake-X vs Threadripper turns out.